Everything you need to know about Dwarf House. 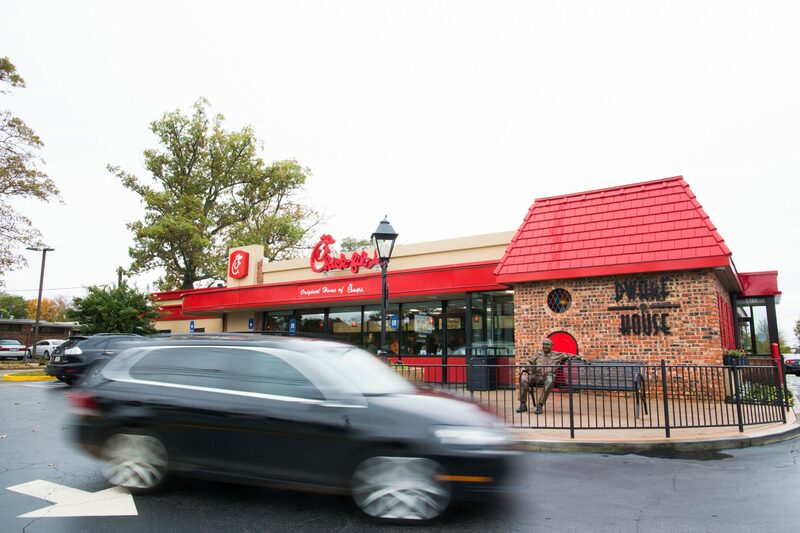 Tucked into an Atlanta suburb sits a culinary landmark—the first Chick-Fil-A to ever serve up a chicken sandwich. S. Truett Cathy and his brother Ben opened the little red-roofed restaurant in Hapeville, Georgia, in 1946. While it was originally called the Dwarf Grill, it was later renamed the Dwarf House, which has stuck ever since. There Cathy tested variations on chicken sandwiches, serving them up to customers and asking for feedback. Soon he stumbled on a recipe good enough to build an entire fast food chain around. 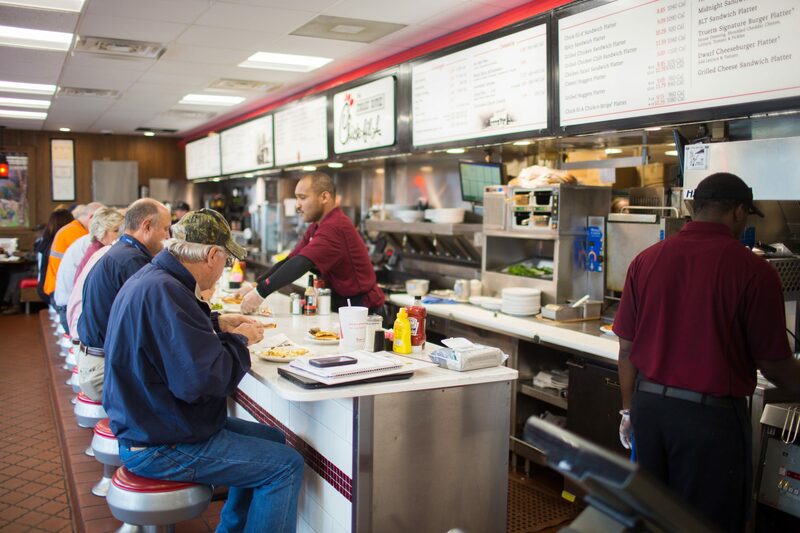 While Cathy’s chicken sandwiches are now sold at over 2,000 restaurants across the country, the little Dwarf House restaurant is still special—and it’s still open today, making it a mandatory pit stop for all Chick-Fil-A super fans. It’s easy to stop in, too, because unlike the average Chick-Fil-A, the Dwarf House is open 24 hours a day from 6 a.m. Monday morning to 10 pm Saturday night. It is closed on Sundays, though, because it is still a Chick-Fil-A. That said, the Dwarf House is quite unlike any other Chick-Fil-A you’ve visited. First of all, there’s table service where guests seat in little booths and are handed copies of the chain’s original menu, which is more akin to a diner than what you get at your average fast food joint. Sure, you can find the original chicken sandwich, but there’s also BLTs, something called the Midnight Sandwich (it’s a ham and cheese), coconut icebox pie, and the famous Hot Brown, a toasted chicken sandwich drowning in gravy and cheese. There are Southern sides too, including macaroni and cheese, cornbread, collard greens, deep-fried okra, and candy-pecan topped sweet potato soufflé, none of which are available at Chick-fil-A restaurants nationwide. And despite what the chain’s long-time anti-beef advertising campaign might indicate, the restaurant also offers steaks and hamburgers, which have been on the menu since the beginning. While everyone who makes It to the Dwarf House has access to the original 1946 menu, only a select few have access to the original 1946 Dwarf House menu prices. The elite group of Chick-Fil-A fans who are granted entry to the “Blue Menu” club are hand selected by the Cathy family and they are a very select bunch—only two have been awarded special menu access in the last 20 years. Once they make the cut, they can order a hamburger for 15 cents, a steak plate for 65 cents, and a cup of coffee for just a nickel. Whether you’re paying 1946 prices or 2018 ones, though, there are plenty of reasons to visit the Dwarf House. There’s a reason customers have been pulling up to the little restaurant since 1946 and it’s not just chicken sandwiches.